We really have had April showers over the last few days. Hopefully, as in the rhyme, these will "bring forth the May flowers" and perhaps also some warmer weather. 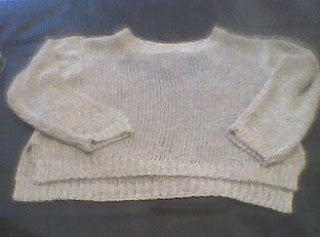 I have been out in the showers to look for a lightweight jumper in a pale colour. There are lots of summer jumpers around in pretty, pastel-coloured cotton or acrylic knits but I settled on this one. I would describe the colour as a beige-pink with a metallic gleam. I love the shape, which is cropped at the front with the back a little longer and there are slits at the sides.